The Dales Trail is our big charity event of the year, in February at our AGM members nominate and agree, after some discussion, which charity we will support each year. 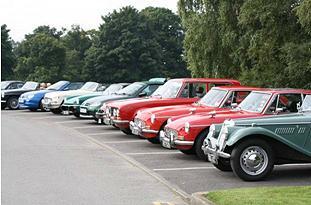 This year we agreed to support the South Tees Hospitals Friarage MRI Scanner Appeal. 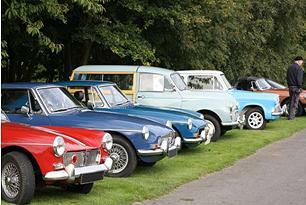 This year we had over 40 entrants from near and far and a superb variety of classic cars. 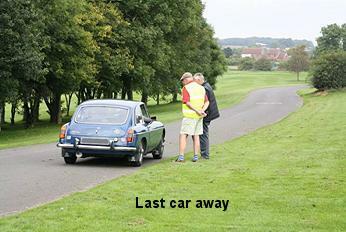 The entrants started arriving at 9.30 at Romanby Golf Club for registration a coffee and bacon butty! 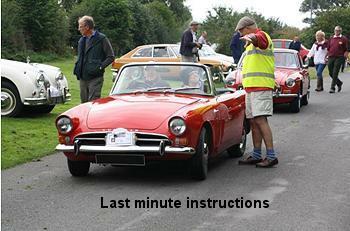 Jim and Bill did a fine job of marshalling the cars forming an impressive display on either side of the entrance drive, a truly superb setting for any car rally to start. 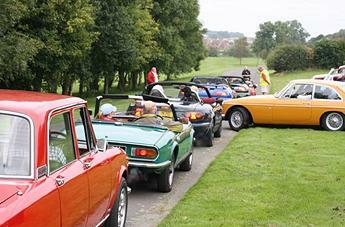 Following the registration the marshals set the cars off at two minute intervals, this caused a bit of a traffic jam and the shaking of some golfers heads who were arriving to tee off. The route took the cars to Bedale then on to Masham, the route continued southwards via Ilton to Patley Bridge where there are plenty of tea rooms. The route then wended its way out of Patley Bridge turning north to Kettlewell, some good pubs here for lunch. The route then took us north to Leyburn turning east and heading home via Bedale again. If you did not get lost you should have done 84.1 miles! The cars started to arrive back round about three o’clock and as people gathered for the presentations there was a lot of discussion about the route and which pub people had stopped at for lunch. During the day we ran a tombola and second hand book stall in total we raised £750 for the MRI Scanner Appeal. 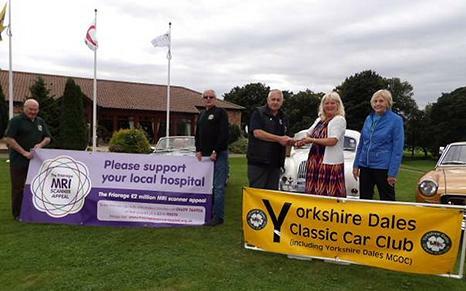 YDCCC Chairman Dave Simpson presented the check to Judith Masterman from South Tees Hospitals Charity. Chairman Dave Simpson and Secretary Sheila Mason present cheque to Judith Masterman. 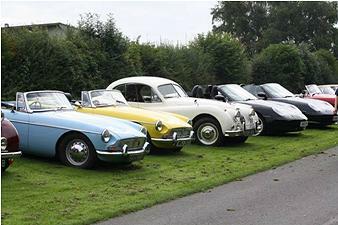 Judith was asked to wander round the assembled cars and pick out the one she would most like to take home, this was a task she took very seriously and went missing for some time as she looked over the cars. 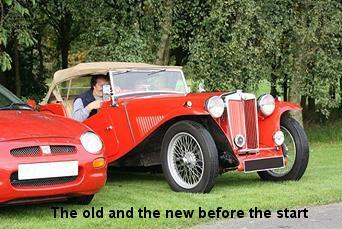 Her final decision was a 1950 MG YA owned by Bernard Meynell from Nunthorpe near Middlesbrough. 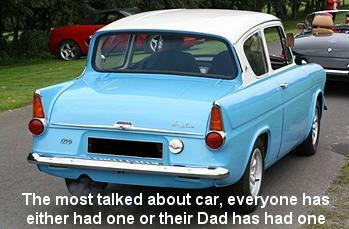 Bernard has owned this car for over 30 years and has completely restored the car himself, although he did admit to having help with the upholstery. The car has now done 114,000 miles but managed every hill on the route. 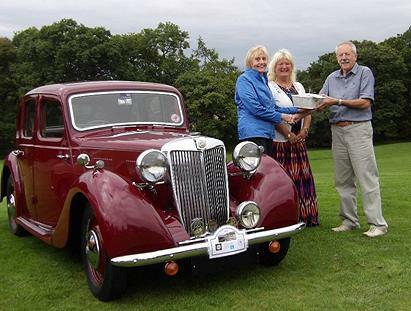 Sheila presents prize to owner of the car Judith would most like to take home with her. 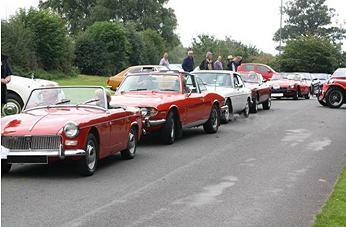 We have a prize for the car and crew that have travelled furthest to take part in the event. 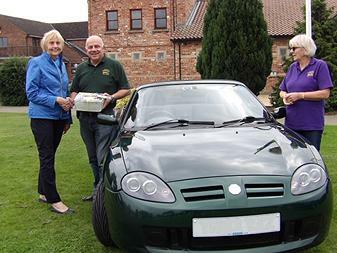 This year the prize was awarded to Colin and Helen Readwin who travelled in their 2003 MG TF from Anstey in Leicestershire some 137 miles to join us. 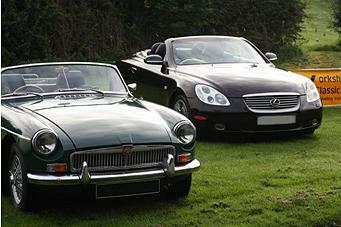 Colin left his 1971 MGB GT in the garage this year, perhaps he will come along in it next year. Dave presents prize to couple who travelled furthest to take part. Thank you to Dave Simpson for planning the route, Kate Simpson and Sheila Mason for their impeccable organisation, Mavis Burton and Angela Gill for running the tombola, Sheila’s granddaughter for running a very successful book stall, the Management and Staff of Romanby Golf Club for allowing us to use the golf club which was an excellent venue and finally the YDCCC members for their contributions to the MRI appeal.